There’s been a fair amount of clean-energy-related news coming from in and around the Capital Beltway in recent weeks. In solar, a new report by EQ Research found that Pepco, which operates in parts of Maryland and Washington, D.C., takes a month longer to connect solar projects to the grid than any other utility in the country. More on that report at the top of our state roundup below. Another piece of recent news from D.C. was the U.S. Supreme Court’s ruling on the U.S. EPA’s Mercury Air Toxics Standard (MATS). The court determined in a 5-4 vote that the EPA failed to adequately consider the costs and benefits of the MATS rule’s $9.6 billion price tag. The court did not strike down the rule, but deferred action to the lower court. The decision has sparked debate over the fate of the Clean Power Plan. EPA Administrator Gina McCarthy insists the Maximum Achievable Control Technology Standards ruling will have no effect on the administration’s plan to limit emissions from power plants, and opponents continue to take it seriously. Since the Supreme Court ruling, the Koch-funded Institute for Energy Research has sent letters to public utility commissioners in all 50 states, urging them to reject the Clean Power Plan. In Congress, lawmakers are battling over how to vote on the Iran nuclear deal, which will have implications for global oil prices. The House and Senate are also working on several pieces of energy legislation, including a Republican bill (S. 1227) that would bring microgrids to isolated areas. This week, the Senate Finance Committee passed a tax extenders bill that would continue the tax credit for wind through 2016. The bill did not include an extension for the solar ITC. Solar advocates are now pushing to have language added in an amendment. Meanwhile, the White House has introduced a plan to help lower-income Americans gain access to solar power. The initiative will leverage $520 million in new capital from foundations, local governments and social impact investors. Pepco Maryland takes the longest amount of time to interconnect solar installations in the country, according to a report released this week by EQ Research that was produced on behalf of the solar industry. It takes Pepco an average of 76 days to interconnect a solar user in Maryland, and an average of 51 days in Washington, D.C. -- the second-slowest interconnection time in the U.S. According to Pepco, the time is needed “to protect the integrity of the distribution system.” But other utilities have been able to safely connect solar much faster. Baltimore Gas & Electric takes an average of 15 days to grant interconnection approval. Eversource in Connecticut has the fastest connection time -- just five days. The national average to interconnect a solar array in the U.S. is 25 days. While interconnection times could be much faster, Maryland is still seeing record levels of adoption so far this year. In the first quarter of 2015, Maryland cracked the list of the top 10 states for solar installations, with a record-breaking 174 percent increase in new solar capacity in the first quarter of this year compared to the same time period a year ago, according to the Solar Energy Industries Association. Maryland now has a total of 242 megawatts of solar -- enough to power 27,000 homes. The District is also upping its clean energy game. Washington, D.C. will soon get 35 percent of its power from wind with a 20-year PPA with Iberdrola Renewables' 46-megawatt South Chestnut wind farm in southwestern Pennsylvania, North American Wind Power reports. Dominion Virginia Power and Appalachian Power have both filed their integrated resource plans (IRPs) for 2015. Appalachian intends to boost its clean energy credentials by working toward generating more than a fifth of its energy from solar and wind in 15 years' time, The Roanoke Times reports. Appalachian also plans to reduce its reliance on coal-fired power plants from 72 percent of its energy mix to just more than half. Dominion also repeatedly referenced the “uncertainty” created by the Clean Power Plan, and said it doesn’t anticipate closing any coal-fired power plants in the coming years. The IRP references SB 1349, which states that Dominion should keep coal as a “significant part of the Company’s generation portfolio for as long as possible, recognizing the regulatory threat to existing coal units posed by the CPP." New York City sometimes gets a bad rap for being grubby, but when it comes to energy, New York state is taking aggressive steps to clean up. The New York State Energy Plan, released in late June, lays out targets under the Reforming the Energy Vision (REV) proceeding that would amount to an 80 percent reduction in greenhouse gas emissions by 2050. The 2030 targets include getting 50 percent of the state’s electricity from renewable sources, decreasing greenhouse gas emissions by 40 percent from 1990 levels, and reducing energy consumption in buildings by 23 percent. With the report, Gov. Andrew Cuomo announced he will seek $5 billion over 10 years to support programs like the NY-Sun solar initiative and the New York Green Bank. The NY-Sun Initiative has helped New York achieve a 300 percent increase in the deployment of solar power between 2011 and 2014. The New York State Energy Research and Development Authority will also seek an additional $1.5 billion to promote large-scale solar and wind projects. Other components of the REV proceeding are also moving forward. On July 1, utilities filed their proposed REV demonstration projects with the New York Public Service Commission. The plans include microgrids, community energy, behind-the-meter storage and efficiency programs. New York is also moving ahead with an expanded retail demand-response program that requires utilities to have dynamic load management programs available by July 2016, RTO Insider reports. Governor Cuomo has made a couple of other announcements in recent weeks that forward the roll-out of greentech in the state, including selecting 83 awardees to complete microgrid feasibility studies. Last week, Cuomo announced a new shared renewables initiative designed to bring clean energy to low-income households. Separately, the New York State Department of Environmental Conservation recently released its findings on the environmental impacts of hydraulic fracturing, substantiating the decision to outlaw the controversial drilling technique. This month, Mass. Gov. Charlie Baker filed legislation (S. 1965) that would require electric utilities to solicit long-term contracts for clean energy generation, predominantly from hydropower. The state has also taken steps to support clean energy with $1.1 million in funding from the Massachusetts Clean Energy Council for three projects in the state that will convert organic materials into energy. Net metering caps for rooftop solar continue to loom, however. Environmentalists and solar advocates are urging legislators to extend the credit. Gov. Baker has said he strongly opposes lifting the cap. Lawmakers in Maine recently passed a bill, overriding Gov. LePage's veto, which sets the stage for the state to adopt an innovative alternative to net metering. The solution hinges on a “Standard Buyer” that would aggregate and monetize the benefits of distributed solar. Also in Maine, SunEdison announced it has started construction on the Bingham Wind project. The 185-megawatt project is expected to be the largest of its kind in New England. Cape Wind, a 130-turbine wind project off the shores of Massachusetts, was on track to be the first offshore wind project in the U.S. until it was hit with a series of legal challenges funded largely by billionaire businessman William Koch. Now, the much smaller Block Island project is on track to be the first offshore installation in the country. The foundations for the five turbines were shipped from Spain earlier this month and will be installed by mid-September, the AP reports. 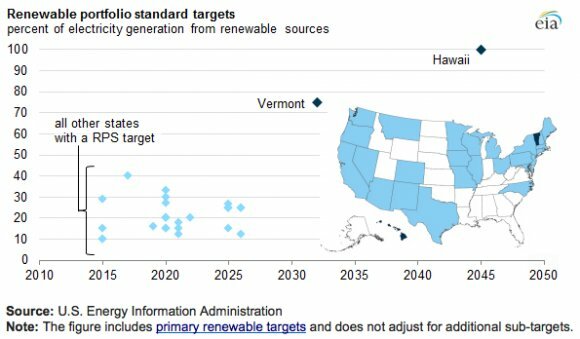 Shortly after Hawaii passed a target of having 100 percent renewable energy by 2045, the Vermont legislature passed an aggressive 75 percent renewable energy target by 2032. The two new RPS goals are much higher than those of any other state in the nation. Vermont’s Public Service Department is accepting written comments on how to reach the targets through July 24. The department will release a final plan in January 2016. In June, Westar Energy announced it will seek to raise fixed charges and increase fees on solar customers from $12 per month to $27 per month by October 2019 as part of a $152 million rate hike. Solar energy advocates protested against the changes this week at a public hearing in southwest Topeka, The Topeka Capital-Journal reports. As the release of the final Clean Power Plan rule approaches, stakeholders in coal-dependent Missouri are debating how to structure the state’s efficiency program. Regulators opened a three-day hearing on the state’s efficiency goals this week, EnergyWire reports. Ameren Missouri, the state’s largest electric utility, has proposed increasing energy savings targets by 37 percent, to 583.6 gigawatt-hours from 2016-2018, The St. Louis Post-Dispatch reports. But opponents, including PSC staff, the Office of Public Counsel, and the Sierra Club, say the deal falls short of what’s achievable, and is well below the 793 gigawatt-hour goal the utility set from 2013-2015. The way the program is structured, the efficiency goals could be tossed out completely if Ameren doesn’t like the plan the PSC comes up with. Separately, Missouri regulators have rejected the proposed $2.2 billion Grain Belt Express, a high-voltage power line intended to support a multi-state wind energy project, the AP reports. Developers say the rejection won’t affect their work in other states. Illinois’ renewable energy standard will sit in a holding pattern for the summer as lawmakers wait for the EPA to finalize the Clean Power Plan, as well as a PJM Interconnect capacity auction slated for later this summer, before they move ahead with energy reforms. Meanwhile, the city of Bloomington, Ill. has set rules to try and achieve 100 percent renewable power. Gov. Scott Walker, who is now officially a GOP presidential candidate, has said he will not comply with President Obama’s Clean Power Plan. At the same time, Madison, Wis. is moving ahead with plans to establish a solar loan program, Wis.-based co-ops continue to drive the community solar market, and the White House has honored the founder of the Islamic Environmental Group of Wisconsin for her educational work on clean energy. Like Gov. Walker, Indiana Gov. Mike Pence has come out in strong opposition to the Clean Power Plan. Pence recently said that states should “refuse to submit a state plan,” The Indianapolis Star reports. According to a recent report by the Indiana Utility Regulatory Commission, the state is actually being held back by scrapping its energy-efficiency program. The report found that Energizing Indiana produced enough savings in 2014 to power nearly 38,000 homes a year and was responsible for creating a significant number of jobs in the state, Fox 28 reports. Under a new plan signed by Gov. Pence, utilities can create their own efficiency programs and charge consumers for them. Efforts to advance clean technology deployment continue, however, as Indianapolis Power and Light begins work on a 20-megawatt energy storage facility, one of the largest in the Midwest. The project will reduce greenhouse gas emissions by smoothing out variations between supply and demand. After some back and forth, Xcel energy and solar developers in Minnesota have reached an agreement to limit co-located community solar projects to 5 megawatts. The Commission approved the deal in late June. As of last month, the state had about 1.5 megawatts of community solar on-line, and 1,166 megawatts of community solar projects in the pipeline. It’s unclear how the pipeline will be affected by the recent agreement. Earlier this month, the Iowa Economic Development Authority and the Iowa Department of Transportation launched a request for proposals for the development of a state energy policy, The Cedar Rapids Gazette reports. Iowa is one of just 10 states in the U.S. that does not have an energy plan, according to the National Association of State Energy Officials. Once a provider is selected, working groups will be formed to review data and shape goals pertaining to Iowa’s energy resources, transportation and infrastructure, economic development and energy careers, and energy efficiency and conservation. In utility news, Iowa’s two investor-owned utilities -- MidAmerican Energy Co. and Interstate Power and Light, Alliant Energy's Iowa unit -- are refusing to offer net metering to third-party solar projects, which clean-energy advocates say violates an Iowa Supreme Court ruling, Midwest Energy News reports. Separately, MidAmerican should find out in August if its $900 million wind project, which would add 552 megawatts of wind generation at two sites in Iowa, will move forward. Interstate Power and Light, meanwhile, has agreed to drastically cut pollution at its two largest coal-fired power plants, which is expected to cost the utility $620 million, under a Clean Air Act settlement. IP&L will also retire or convert five other coal-fired plants to clean-burning natural gas, pay a $1.1 million fine, and spend $6 million on a range of environmental projects under the agreement. In a controversial move, Ohio legislators froze the state’s renewable energy portfolio standard through 2017. Now, the Energy Mandates Study Committee, a panel assembled to determine the future of Ohio’s renewable energy and efficiency laws, looks likely to reduce (but not repeal) the RPS, The Columbus Dispatch reports. The committee held its final meeting this week, and has until Sept. 30 to submit recommendations to Ohio House and Senate leaders. 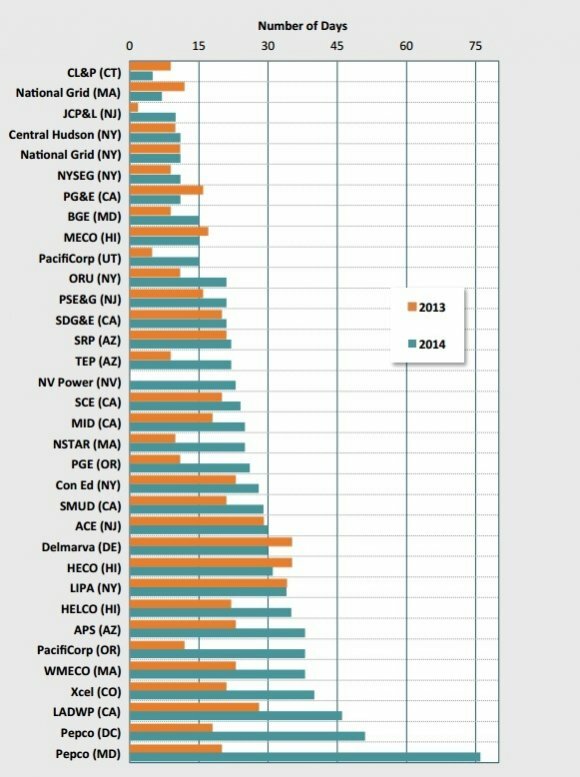 Apparently, the freeze hasn’t completely stopped the solar industry from growing. According to the Green Energy Ohio, a statewide renewable energy advocacy group, the latest figures show there are nearly 1,600 privately owned solar arrays in Ohio, with a total generating capacity of more than 120 megawatts. But that news is unlikely to satisfy renewable energy advocates (or The Akron Beacon Journal editorial board) who want to see Ohio’s 25 percent by 2025 alternative energy target fully reinstated or even raised. Later this year, Michigan’s energy-efficiency and renewable-energy programs are set to expire, after generating nearly $3 billion in investment. Lawmakers from both parties are now trying to advance very different pieces of legislation to replace PA 295. Earlier this month, Republican lawmakers introduced a new energy policy that would scrap the requirement for utilities to get a portion of their energy from renewables, Michigan Radio reports. The two-bill package (SB 437 and 438) would also reduce net metering for solar customers to the wholesale rate (which clean-energy advocates say doesn’t count as net metering at all). Businesses are divided over whether the programs should be continued, Crain’s Detroit Business reports. Michigan's two major utility companies, DTE Energy Co. and Consumers Energy Co., want to drop the mandate in favor of voluntary programs and integrated resource plans. But clean-energy companies and some large consumer businesses, including Ford Motor Co. and Whirlpool Corp., are skeptical that utilities will produce meaningful alternatives. The Alliance for Solar Choice said the senate bills would be “devastating” for the solar industry. In April, Democrats introduced an alternative energy plan (HB 4518, 4519 and SB 295, 296 and 297) that would increase Michigan's renewable energy requirement to 20 percent by 2022. But that legislation has yet to make it out of committee. California’s investor-owned utilities have been busy in recent months finishing up their long-awaited distribution resource plans, which were submitted to the PUC earlier this month. As Greentech Media’s Jeff St. John reports, utilities have to come up with methods to measure the benefits that DERs could provide on a circuit-by-circuit basis. And eventually, they’ll be asked to compensate DERs for these values, in lieu of traditional utility capital investments. That means plenty of work still lies ahead. California regulators have also been busy. Earlier this month, the PUC approved residential rate reforms that will flatten the state’s four-tiered rate structure to two tiers, prevent utilities from imposing fixed fees that make solar less competitive, and require utilities to create time-of-use rates to help manage peak demand. The plan has received mixed reviews from both solar companies and utilities. In other California solar news, utilities and rooftop solar installers are both pushing for lawmakers to count distributed solar toward California’s renewable energy standard as they consider increasing the target to 50 percent by 2030. Los Angeles has assembled a Solar Action Committee to facilitate the expansion of residential and commercial solar PV in the area. And the California Independent System Operator Corp. has, for the first time, approved rules that will enable aggregated distributed energy resources, such as rooftop solar, to participate in the wholesale energy market. Arizona continues to be a hot spot for solar activity. Both Tucson Electric Power (TEP) and Arizona Public Service are proposing to lower compensation for net-metered rooftop solar customers. On the recommendation of Arizona Corporation Commission staff, TEP has decided to move its request (which would lower net metering from the retail rate of $0.11 per kilowatt-hour to the wholesale rate of $0.058 per kilowatt-hour) to a formal rate case expected this fall. National solar installers are strongly opposed to the changes, while local solar installers have complained of market uncertainty. As TEP looks to change rates for residential solar customers, it’s also planning to expand utility-owned options for potential residential solar customers. Earlier this month, TEP proposed to expand its rooftop solar program and launch a new $10 million community solar offering in 2016. Last month, lawmakers in Hawaii passed legislation to get 100 percent of the state’s electricity from renewable sources. How exactly the state will get to that target has yet to be determined. Another debate is taking place in Hawaii over NextEra’s proposed acquisition of HEI. The deal has been approved by the utility’s shareholders and the Federal Energy Regulatory Commission. But just this week, two state agencies and Hawaii Gov. David Ige have recommended the state PUC reject the deal. Hawaii's PUC and the band of intervenors are set to consider the merger through the fall, which would push a final decision out until spring of next year. After reaching an agreement to raise the net metering cap in Nevada to 235 megawatts through the end of the year, solar advocates have claimed that NV Energy misled lawmakers, and that the 235-megawatt limit could be hit as early as next month. The Alliance for Solar Choice has filed an emergency petition with the Commission to clarify that the existing program can continue until a new net metering program is put in place. In other Nevada news, NV Energy has partnered with the state to install charging stations on U.S. Route 95. Also, on the heels of Austin Energy’s record-low utility-scale solar purchase, NV energy set a new benchmark, paying 3.87 cents a kilowatt-hour for power from a 100-megawatt project being developed by First Solar. On the residential front, Vivint Solar expanded its business to Nevada and New Mexico just ahead of a blockbuster $2.2 billion acquisition this week by SunEdison. On July 1, new legislation took effect in Georgia that allows residents to secure third-party financing for the installation of solar projects. The bill had strong support from all stakeholders, passing unanimously in the state legislature. The legislation will allow national solar installers to increase their presence in the state. Georgia Power is also taking advantage of the new law, launching a rooftop solar business under an unregulated arm of the company. Georgia Power is "a great brand, and we’re going to stick our brand on the system we sell our customers, and I think that provides a great benefit to customers,” said Norrie Mckenzie, VP of renewables, in a recent interview. Politicians, businesses and interest groups are divided over a ballot initiative in Florida that would allow people to buy solar electricity from a company other than a regulated utility. In a rare alliance, free-market conservatives have joined with environmental groups in favor of the change. Meanwhile, the Florida League of Cities, an organization that represents 400 municipalities, has joined with utilities in opposition. If the ballot initiative is approved by the Supreme Court in September, the motion will be considered by voters in 2016. In other Florida energy news, NextEra has released plans to build a $1.2 billion high-efficiency natural-gas power plant in Okeechobee County, Law 360 reports. Also, large energy users, including Wal-Mart, want to opt out of Florida's energy conservation program, claiming they can get better results for less money. But the PSC has expressed concern that the proposal would shift costs to small businesses and residential customers. Lawmakers voted to limit Louisiana’s tax credit for solar arrays at the end of the state’s legislative session last month, the AP reports. The incentives have reportedly cost the state $147 million since 2009. Lawmakers have now capped solar spending at roughly $20 million next year, in an effort to curb the state's $1.6 billion budget deficit. The solar industry says it’s being picked on unfairly. Duke Energy continues to increase its renewable energy deployments in North Carolina, having recently started construction on its fourth major solar facility in the state. Duke now has 16 solar projects working or under construction in North Carolina. The utility has also proposed lower overall rates for its North Carolina customers. As North Carolina starts to become a meaningful market for renewable energy, major tech brands Google, Apple and Facebook have warned of negative repercussions from proposed legislation that would cut back the state’s renewable portfolio standard from 12.5 percent to 6 percent by 2021. The legislation (HB 332) has already passed in the state House and current sits with the senate. Amazon is also active in North Carolina and has commissioned the state’s first utility-scale wind farm, that will produce approximately 670,000 megawatt hours of wind energy annually to power Amazon’s data centers in Ohio. Alabama Power will retire three coal units and convert four others to natural gas, under a settlement agreement with the EPA that was more than a decade in the making. The utility’s remaining plants must also meet higher emissions standards, plus the utility must spend at least $1.5 million to install charging infrastructure for electric vehicles. Separately, Alabama Power plans to install up to 500 megawatts of solar power over six years, AL.com reports. The program is specifically designed for commercial customers that want to be greener or have internal mandates to meet. The proposal must be approved by the PSC. Google is also be bringing more solar to the state by converting an old coal-fired power plant into a renewable energy-powered data center in an agreement with the Tennessee Valley Authority, The Guardian reports. Last month, the Texas legislature came to a close without passing a bill that would have repealed Texas’ RPS, which helped the state to get more than 10 percent of its electricity from wind. This month, Hewlett-Packard announced a 12-year contract to buy 112 megawatts of wind energy from SunEdison. Facebook is also building a wind power plant in the Lone Star State to power its new $1 billion data center near Ft. Worth. A federal court of appeals upheld Colorado’s renewable energy standard earlier this month, The Denver Post reports. Washington-based Energy & Environment Legal Institute, the free-market-oriented litigation group that brought the suit, claimed that the 30 percent renewable energy target was unconstitutional. Another piece of Colo. news: Denver’s electricity demand is surging from the booming marijuana business, making it harder to meet efficiency goals. Oklahoma Attorney General Scott Pruitt filed a lawsuit earlier this month to try to block the U.S. EPA’s Clean Power Plan, Bloomberg reports. “The Clean Power Plan is an unlawful attempt to expand federal bureaucrats’ authority over states’ energy economies in order to shutter coal-fired power plants and eventually other sources of fossil-fuel-generated electricity,” said Pruitt, a Republican, in a statement. The lawsuit came two days after the EPA was faulted by the Supreme Court for failing to consider the costs and benefits of its mercury rule.